We design and make a lot of Fire related Ironwork. Straight away we need to discern the difference between Wrought Ironwork and Cast Ironwork in this article. 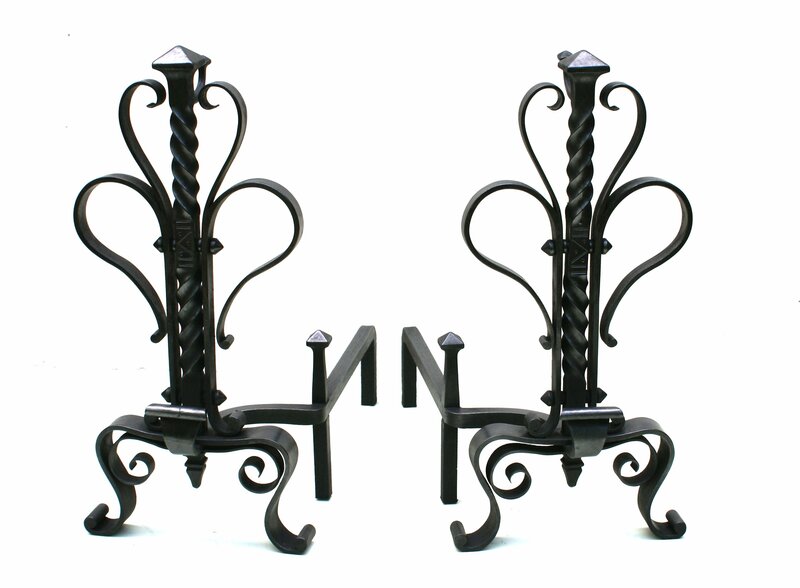 We at Burrows Lea Forge work in the medium of Wrought Iron/Mild Steel, which can be forged, bent and generally manipulated by heat in a Blacksmiths Hearth, it is ideally suited to ‘limited batch’ production and ‘one off’ bespoke items. Cast Iron like the name implies, is cast. In a Foundry molten Iron is poured into a pre-formed sand or ceramic mould this process lends itself to be ‘batch/semi mass’ market. Confusingly hot forged Mild Steel is often referred to as ‘Wrought Ironwork’ even though it is Wrought Iron-less…… its very confusing I know, I have to explain it all the time, sorry for that! Hand forged fire dog and basket. With that over, back to my Blog, the most obvious Wrought Ironwork fireside items are Fire Baskets and Dogs. The ‘Dogs’ are traditionally separate to the Basket and can be used to support/position large logs while they are burning in the fire, but they can be used in conjunction with the Basket to burn a more wide variety of combustibles. Quite often we have orders for ‘statement’ Fire Dogs, just to create a fire place setting even when there is no intention of using a Basket or ever lighting a fire in the hearth. Fire Dogs and Baskets need to be heavily made; they have to withstand the rigours of heat, weight and the caustic conditions the fire’s ashes create. We like to design specifically for each Hearth; every fireplace has an individual character and it’s a shame to just put in any old grate you find. Good quality Fire Baskets don’t come cheap and should be seen as an investment. A well designed, solidly made Fire basket will last a lifetime and should have an heirloom appeal. At Burrows Lea Forge we always design in serviceability to our work, so you can be sure no matter the use/abuse your Ironwork suffers we can always fix it. 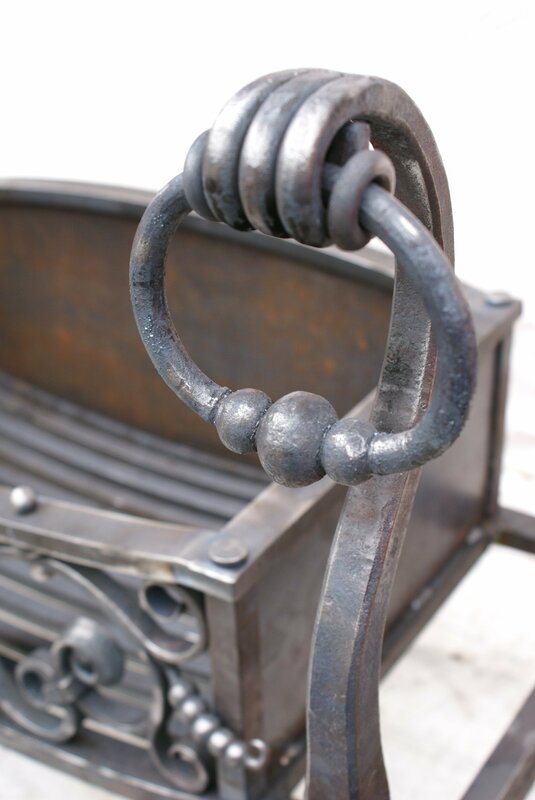 Period Wrought Ironwork Fire Dogs & Baskets are now in great demand as authentic items are scarce on the open market. Period styles fetch high prices, Gothic Revival, Arts & Crafts, Art Deco and Art Nouveau in particular. We like to replicate these styles as they are interesting from a historical point of view, they were designed to look good first…. And fulfil their function second. Before these historic period styles, Fire Basket and Dogs tended to be more functional units as they tended to be used in working (cooking, cottage industry etc.) environments where looks came a poor second place to getting a job done. The other classic and distinct styles are Medieval Gothic, Tudor, Stuart, Baroque and Rocco (There is of course as everything before and in between, but that’s quite subjective). 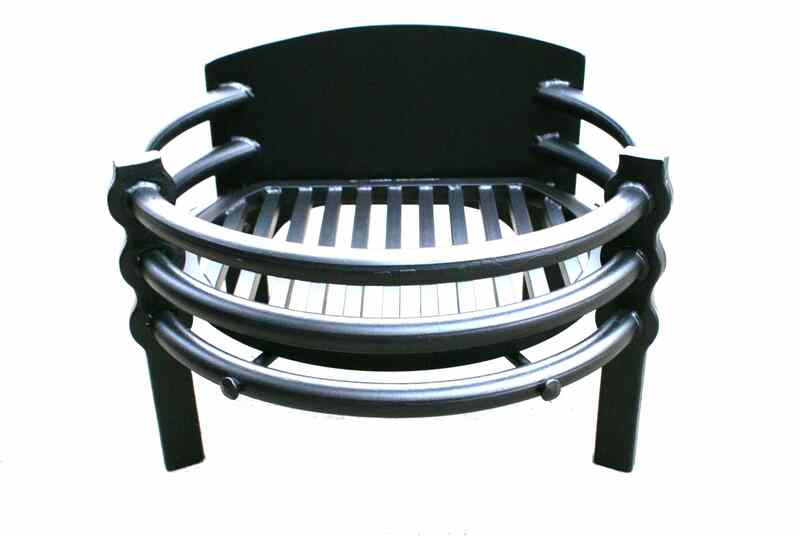 We have never been restricted to period styles and are quite happy to design and make contemporary fire furniture and in the spirit of 19th/ 20th century styles, looks are the priority.